New Delhi : Large parts of India, the Middle East and North Africa will continue to reel under severe water stress over the next four decades, with population and economic growth being responsible for most of the stress, a new study by the US-based Massachusetts Institute of Technology (MIT) has said. Researchers at MIT said they expected 5 billion (52 per cent) of the world’s projected 9.7 billion people to live in water-stressed areas by 2050. Also, by then, about 1 billion more people would be likely living in areas where water demand exceeds surface-water supply. A large portion of these regions — India and MENA — already face water stress. Further, of the 5 billion people, up to 3 billion could be exposed to overly exploited conditions. The population at 2050 under this overly exploited water stress are nearly double the current estimate (1.7 billion people), and among the future scenarios it represents a range of increase between 1 and 1.3 billion people. While population growth and increasing social pressures on global water resources have required communities around the globe to focus on the future of water availability, climate change is expected to further exacerbate the demands on water-stressed regions. MIT researchers used a new modeling tool to calculate the ability of global water resources to meet water needs through 2050 in an effort to assess future water demands and the impacts of climate change. The study applied the MIT Integrated Global System Model Water Resource System (IGSM-WRS), a modeling tool with the ability to assess both changing climate and socioeconomics — allowing the researchers to isolate these two influencers. In studying the socioeconomic changes, they found population and economic growth are responsible for most of the increased water stress. 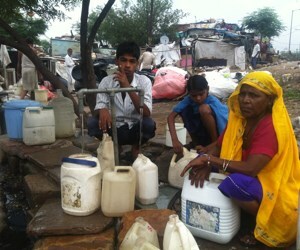 Such changes will lead to an additional 1.8 billion people globally living in water-stressed regions, the study noted. “Our research highlights the substantial influence of socioeconomic growth on global water resources, potentially worsened by climate change,” said assistant director of science research at the Joint Program on Global Change and lead author of the study Adam Schlosser. “Developing nations are expected to face the brunt of these rising water demands, with 80 percent of this additional 1.8 billion living in developing countries”. Looking at the influence of climate change alone, the researchers found a different result. Climate change will have a greater impact on water resources in developed countries. This is because, for instance, changes in precipitation patterns would limit water supplies needed for irrigation. When researchers combine the climate and socioeconomic scenarios, a more complicated picture of future water resources emerges. For example, in India, researchers expect to see significant increases in precipitation, contributing to improved water supplies. However, India’s projected population growth and economic development will cause water demands to outstrip surface-water supply. Overall, the results of the study highlighted the substantial influence of socioeconomic growth on the global patterns of water stress, particularly in developing nations. Additionally, the factors that determine the sign and magnitude of water-stress response vary between major economic and developing regions. The study found that water-stress changes within developed nations are more sensitive to climate drivers, whereas developing countries are far more responsive to socioeconomic growth. In addition, the results imply that the greatest risks to regions facing future water-stress may not be captured by extreme outcomes from global assessments of climate scenarios, but rather by regional extremes occurring within a subset of climate-model projections. Without safe water in their homes, many women and girls become victims of physical attack and sexual violence as they walk long distances to collect water; families are hit by frequent outbreaks of waterborne diseases such as cholera and dysentery because of sharing open water sources with animals; and girls dropout of school, on average, between 30 minutes to 90 minutes walking to look for water. Women and girls are the main providers of household water supply and sanitation in Uganda, and also have the primary responsibility for maintaining a clean home environment. Please support and also share on your networks. A very interesting and important project. I will put it on the website.